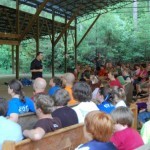 Indian Creek Youth Camp, Clark Sims week, is now over. What a great week in Walker County Alabama near Jasper, Alabama and just north of Tuscaloosa, Alabama. 253 people were at the camp for the session that ran Sunday through Friday. 11 were baptized and 31 rededicated themselves to their Lord. Clark Sims, preacher for the Cottondale Church of Christ, does an outstanding job bringing people together from across the Southeast to worship, study, play and grow as Christians. This was Clark’s 7th year and I hope he has plenty more ahead. I am exhausted at the moment but will post more with a few pictures tomorrow.